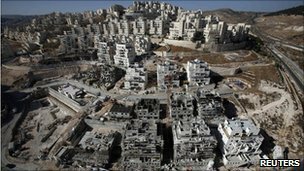 A group of 26 ex-EU leaders has urged the union to impose sanctions on Israel for continuing to build settlements on occupied Palestinian territory. In a letter sent on Monday, they said Israel "like any other state" should be made to feel "the consequences" and pay a price for breaking international law. The signatories include the former EU foreign affairs chief, Javier Solana. But in a written response Mr Solana's successor, Catherine Ashton, said the bloc's approach would remain unchanged. An Israeli foreign ministry official said the proposal represented "a giant leap of bad faith". The exchange came shortly before the US announced it was abandoning efforts to persuade Israel to renew a partial settlement construction freeze so that direct peace talks with the Palestinian Authority could resume. The Palestinians suspended talks in September after a 10-month freeze on settlement in the West Bank, excluding East Jerusalem, expired. The letter sent to European governments and EU institutions, asks EU foreign ministers to reiterate that they "will not recognise any changes to the June 1967 boundaries and clarify that a Palestinian state should be in sovereign control over territory equivalent to 100% of the territory occupied in 1967, including its capital in East Jerusalem". It also asks ministers to set the Israeli government an ultimatum that, if it has not fallen into line by April 2011, the EU will seek an end to the US-brokered peace process in favour of a UN solution, according to the EUobserver website. The EU should link its informal freeze on an upgrade in diplomatic relations with Israel to a settlement construction moratorium; ban imports of products made in settlements; and force Israel to pay for the majority of the aid required by the Palestinians, it adds. It also urges the bloc to send a high-level delegation to East Jerusalem to support Palestinian claims to sovereignty and reclassify EU support for Palestine as "nation building" instead of "institution building". "Time is fast running out", the letter warns, because "Israel's continuation of settlement activity... poses an existential threat to the prospects of establishing a sovereign, contiguous and viable Palestinian state." In addition to Mr Solana, the letter was signed by 10 former leaders of European countries - including Romano Prodi and Giuliano Amato of Italy, Richard von Weizsaecker and Helmut Schmidt of Germany, Mary Robinson of Ireland, Felipe Gonzalez of Spain and Norway's Thorvald Stoltenberg - 10 former ministers and two former EU commissioners. In a letter of response to the former leaders, sent on Tuesday and seen by EUobserver, Baroness Ashton said the EU's approach to Jewish settlement expansion would remain unchanged for the time being. She said the demand for a peace treaty based on pre-June 1967 borders was "commonly accepted" and that she supported the US-brokered negotiations. "The European Union will continue to be at the forefront of efforts to advance the peace process and engage with both the Palestinians and the Israelis to find a way to resolve the conflict," her letter reportedly said. In a statement following the US announcement, she said: "The EU position on settlements is clear: they are illegal under international law and an obstacle to peace. Recent settlement related developments, including in East Jerusalem, contradict the efforts by the international community for successful negotiations." Israeli Foreign Ministry spokesman Yigal Palmor told the BBC that he had not seen a copy of the former European leaders' letter, but believed their focus on the settlements issue seemed "strange and harmful". "It is difficult to see how the call for sanctions and Israel's isolation will promote peace, but clearly this will diminish the EU's capability to play a constructive role in promoting peace in the region," he said.